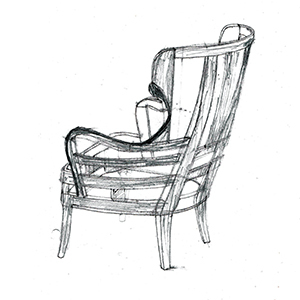 The inception of the Lokalferi line traces back to the original cause behind Bent Chair. 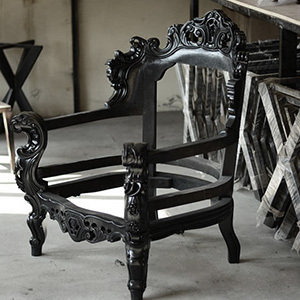 When Bent Chair was conceptualized, the idea was to bring the products of artisans, skilled craftsmen, and homemakers directly to the consumer. We struggled with understanding if we directly listed their products on our platform would we be able to maintain supply and consistency in quality. After months of legwork, we brought together a team of artisans, rug weavers and craftsmen under one roof to create the spectacular Lokalferi line. 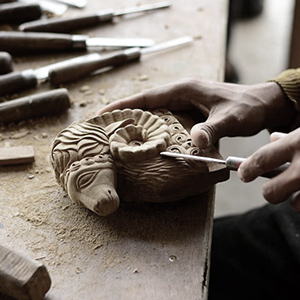 This is our ode to the traditional Indian craft. We worked hard to retain the identity of the designs and add a modern spin to it. Though it was challenging for us to maintain the intricate carvings, bring modern pop to the product while also keeping a check on quality and detailing, we are thrilled with the result. The Lokalferi line is now available for all of you to enjoy and cherish. 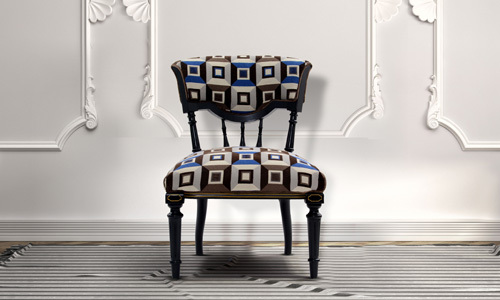 Emir chair brings with itself a touch of class. Made with teak wood, it’s strong, stable and would last long. The perfect finish of the wood and polish makes it even more appealing. Use it at your desk or as an accent piece, it works wonderfully as either. 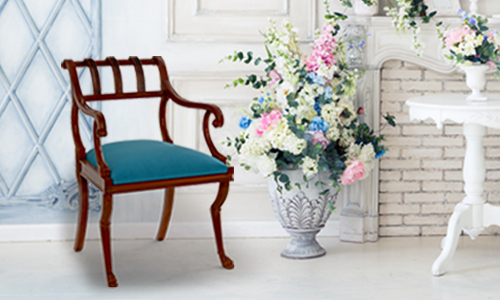 Our Riona Chair featuring a turquoise body and butterfly print upholstery makes an eye-catching piece of furniture. Its armrests and back provide plenty of support for comfort seating. 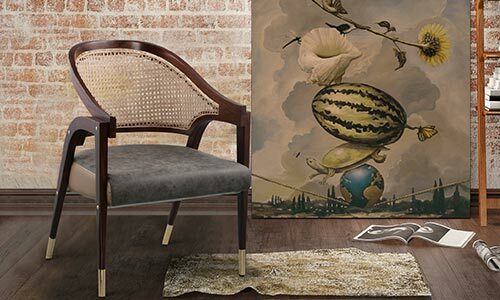 With a muted tone body and colorful butterfly printed upholstery, our Lana chair is an artistic piece of furniture that will add a pop of color and plenty of charm to any space it is kept in. A contemporary design with a touch of pop which will embellish the decor of your home. With great functionality and looks that will style up the overall appeal of your place, it’s a must have. Enjoy comfort and style together. 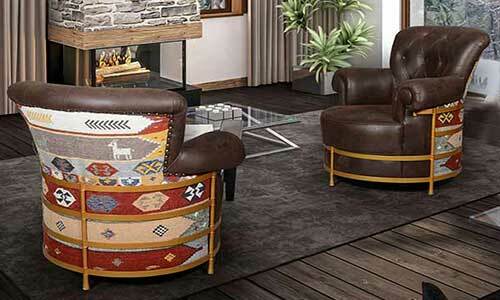 Live life king size with our Maharaja chair. Made from the high-quality Teak wood, it is very durable and will be the throne for generations to come. 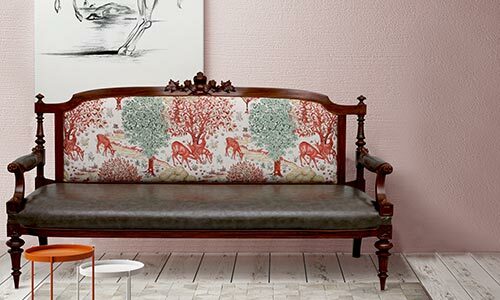 It’s a must if you crave for a comfortable seating at your place and the print on it makes it even more appealing. 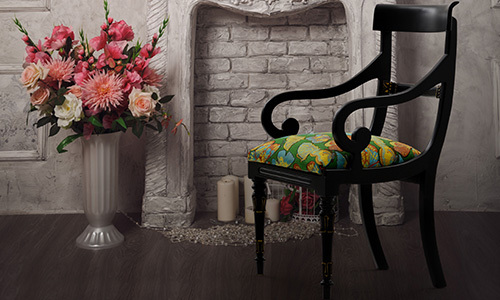 Feel the grandeur and splendor with Rani chair. The detailings in the texture makes it an inviting piece. With a burst of 3D design printed fabrics, this splendid chair is a perfect balance between traditional and contemporary. Pair it with your furniture to create a dynamic set up that spells comfort. This Teak wood sofa is an effortlessly blend of classic and contemporary style making it an ideal update in any modern home. With maximised seating space and armrests to lean against it is designed for how you use it. Made with the most esired teak wood, Amayra chair promises superb stability and great comfort. The gold antique finish on the wood gives it a Vintage look. 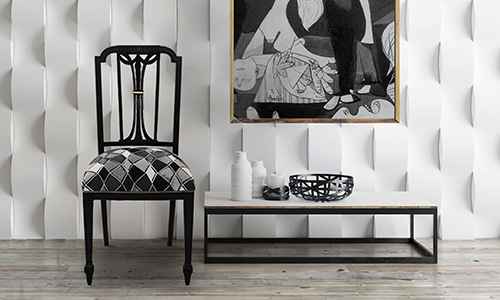 Give your home a touch of sophistication you have been looking for with our chic and elegant Amayra chair. This simple and sleek Lamees chair is a comfortable seating option for the living room, dining room and balcony as well. 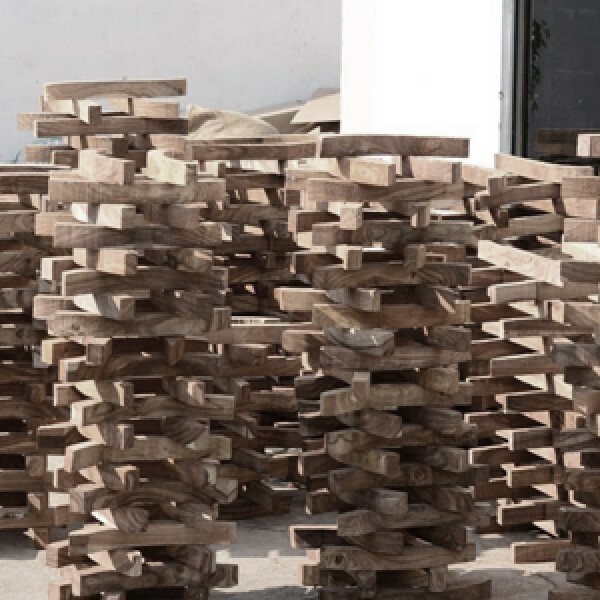 Made with teak wood, you will never doubt it’s quality and strength. The combination of blue and black color makes it a treat to look at. 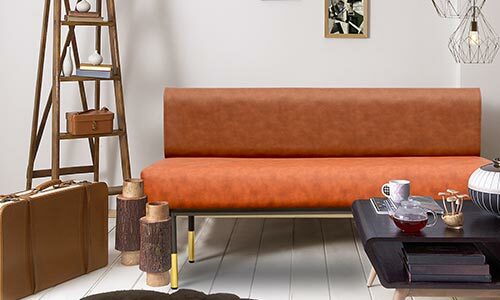 Create a cosy spot for yourself with the Arkin sofa. This sofa is a great way to add comfort to your living area. 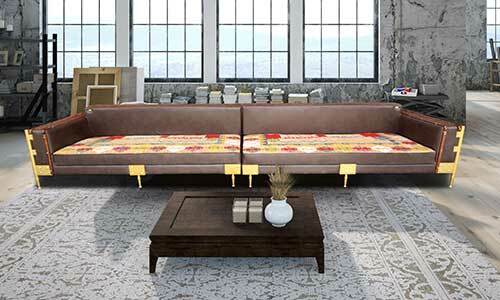 With the right mix of functionality and style, this sofa is just made to ease your living. Nayila chair upgrades the aesthetics of any room it is placed in. The color and the polyester velvet brings alive even the muted spaces in the home. It’s the perfect balance between comfort and style. 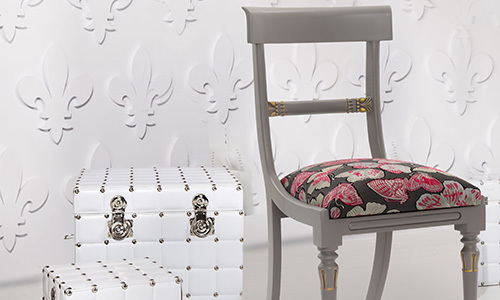 Embellish your home with the perfect Nayila chair. Lean back and relax in the arms of Shahjahan. Experience sheer comfort as its spacious seats provide huge space and lets you sit in variety of positions. The neck and head support is an added advantage. It’s a treat to look at as well hop on. “The name in itself tells a lot about the chair. 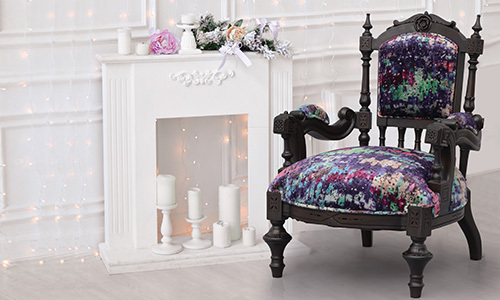 This multicolored, bright and showy chair will jazz up the place just the way you like it. Made with the most desirable teak wood, it’s super stable with ultimate strength. 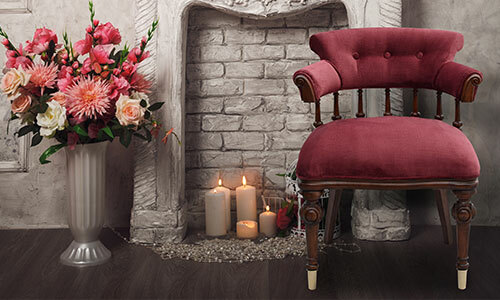 Made with Indian Rosewood, this high-quality chair with classical charm, elegant style is a very durable choice. 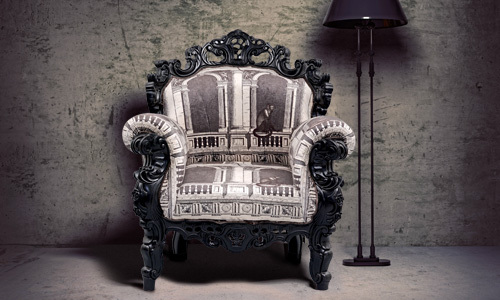 With decorative patches of leather this a great multi-use chair. Comfortable yet stylish, try this Zerina chair to stand out from the crowd. Our Zanubiya Chair is a great combination of form and function. 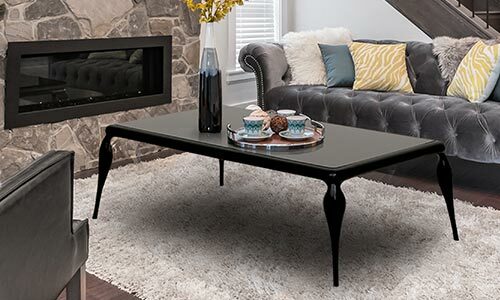 It comes with a classic timeless frame and a trendy geometric upholstery. This chair is super versatile and can be used as a dining chair, desk chair or a living room accent chair. With a geometric pattern upholstery and a designer back, our Aarayna Chair will add both comfort and style to your seating space. 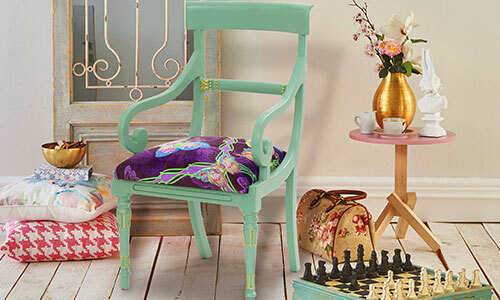 Use it with solid color upholstered furniture pieces to create a coordinated look. Erwin Dining Table is the perfect table for your delicious meal. Eating will be more fun with this beautiful dining table in your home. It will fit into any style of decor and enhance it. Made with the best Indian rosewood, it’s high durability makes it the perfect choice. 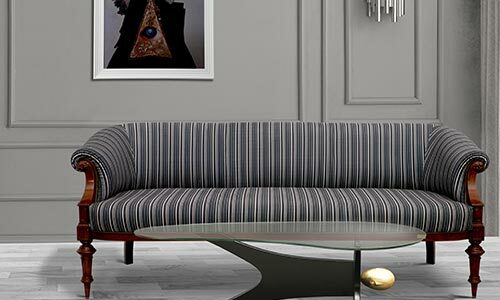 Feel sheer comfort with the classy Elijah sofa that will embellish the look of your place. 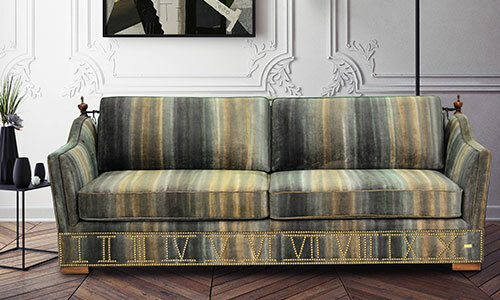 The velvet touch to this sofa increases the style statement and the voguish feel of your home. The rug seat is an added advantage. 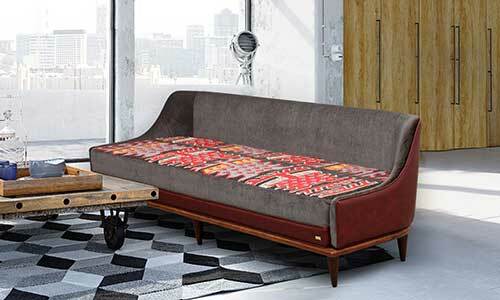 Get comfy and stylish in a go with the Elijah sofa. It’s a blend of mid-century details along with contemporary and chic design to create a stylish space for your home. Made with PU, Dari it’s durable and strong. The color combination adds to the style of the sofa. The perfect pick if you wish to add style to your home. Pairing timeless traditional craftsmanship and modern hues with a teak wood frame and elegant linen-upholstery adding traditional charm to any casual or formal seating group. 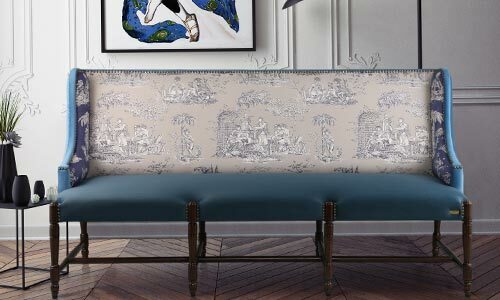 Its artistic upholstery details add a refined touch while its calming blue polyester upholstery blends effortlessly giving rise to an elegant Alma Sofa. 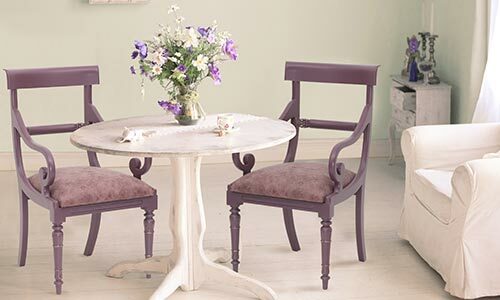 Lend your space a touch of a well-worn effortlessly charming vintage console table. 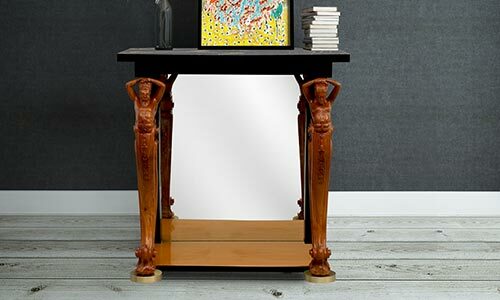 Composed of steam beech wood this simple sleek rectangle console table has a bold black high gloss finish and an impeccably finished rust paint finish on the top. Its sleek design and a simple silhouette make it a must-have to adorn your living space. Simplicity and grace highlight our exquisite looking Amayra Chair. 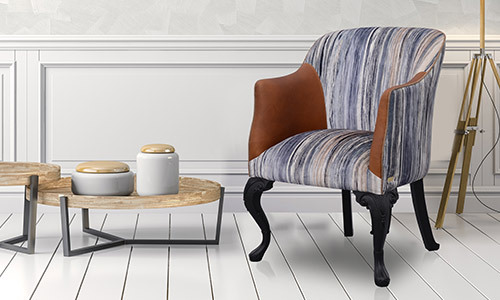 Solid rosewood construction, traditional cane weaving, an alluring dual-toned upholstery and a natural walnut finish crafted legs make this chair a delight to adorn your home space. 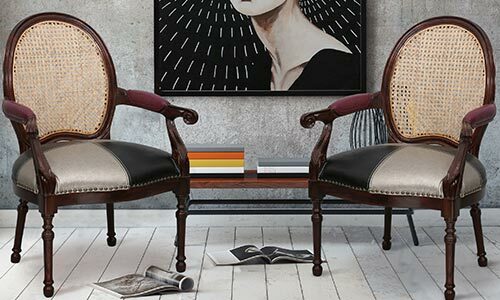 Our Regency styled Amrin Chair features a stylishly curved armrest and a contoured back for comfortable seating. 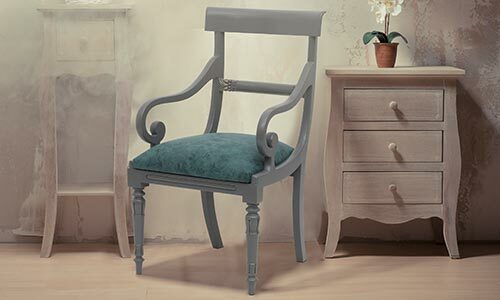 Its bright turquoise upholstery and carved grey frame make it an eye catchy furniture piece. 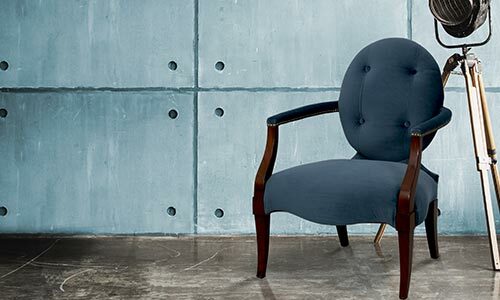 Our Amrin Chair features a beautiful muted toned tufted upholstery which is sure to provide you all the comfort. 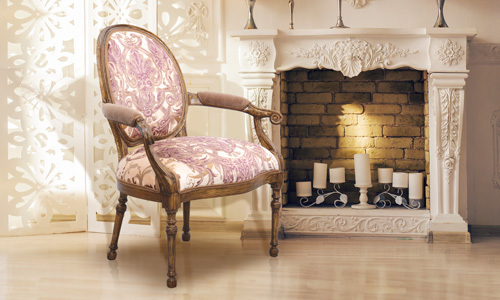 Its a Regency style carved chair with stylishly curved armrests and a contoured back for comfortable seating. 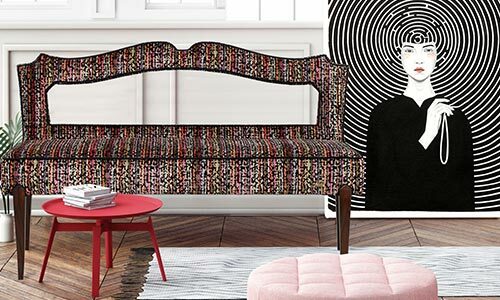 Wrapped in a vibrant print upholstery, our Aura Sofa brings delightful style to any space. 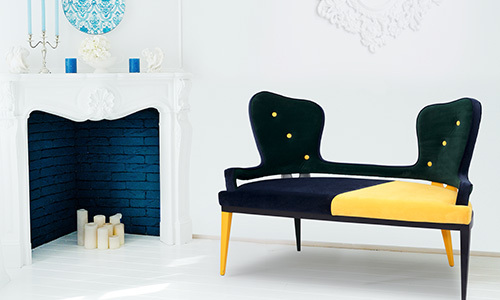 Designed to embrace the sitter, the sofa comes in lovely bright colors. The vibrant upholstery will surely add a contemporary flair to your space while the solid teak wood frame perfectly complements the intricate hand carved curves. Flowing with the richness of Traditional design.gently rolled curved arm Avian Sofa is comfortable and elegant. 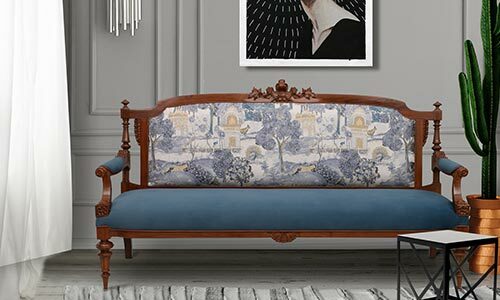 Its wrapped in a calming blue vertical stripe upholstery that perfectly complements the antique walnut finished antique wood carving giving an elegant look without sacrificing the comfort you are looking for. 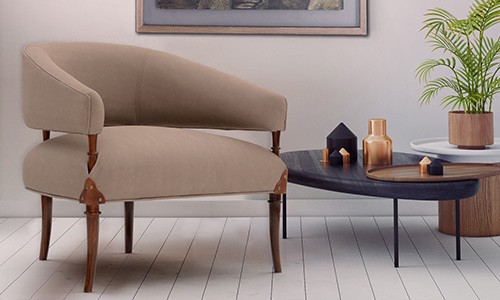 Discover the perfect luxury and extreme comfort with our Edmund Sofa. Unwind in this inviting sofa made up of Steam Beechwood, which is water resistant and has an amazing finish. The Brass Finials give it a totally contemporary look. 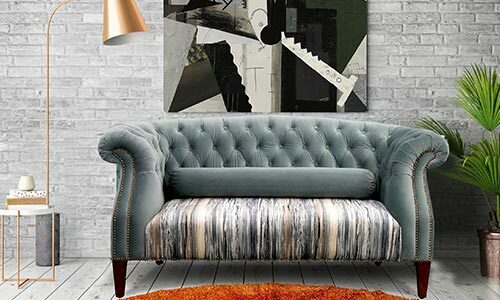 Edmund sofa will add style instantly to your place. Luxuriate in a royal aura with our Empire table. The metal laminated table top and the hand crafted brass sculptors add the perfect elegance to your spaces. It features a great combination of form and functionality and brings out the perfect allure. Strong teak wood construction, has successfully blended with classic and contemporary design making it an ideal update in any modern home. The combination of brown and grey makes it a treat to look at. 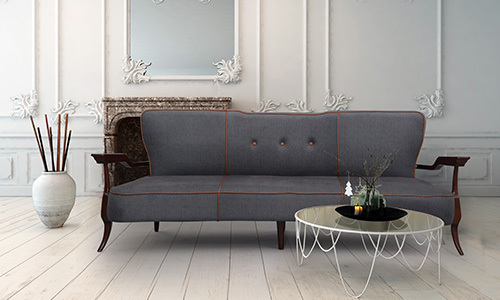 Chic and stylish, our Edgar sofa comes with plush leather upholstery. It comes with a broad seating space that makes it easy for one to get comfortably seated. 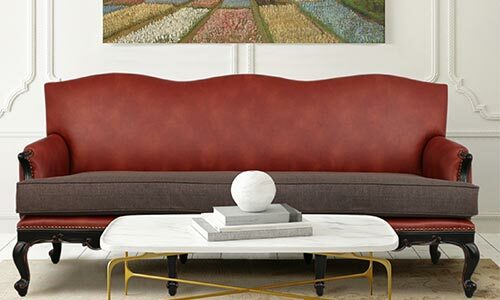 The two-toned upholstery adds visual interest to any space this sofa is kept in. Kia has been the most ambitious chair design for our team. Based on an old classic Empire library chair design, the form has been totally deconstructed to lay bare the upholstery components. These have been copper plated to turn them into decorative accents. The Ram head is finely carved with intricate details and antique finished. 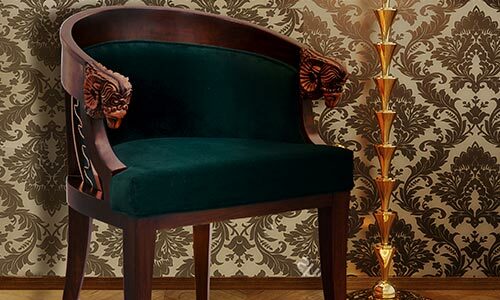 Covered in emerald green velvet, this barrel back chair is a must for any luxurious interior. Wrapped in a calming blue velvet upholstery and constructed in teakwood frame our vintage styled Kim Chair has an elegant appearance. The simple silhouettes and slender walnut finished legs anchor this piece in traditional style, while the velvet detailing on its arms give it a luxurious feel. 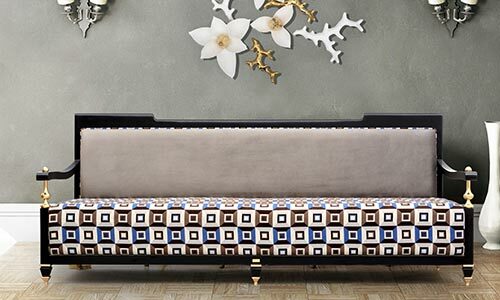 The Leo sofa will surely pop your eyes out with its amazing look. Made from Steam beach, its the perfect pick for your living room. 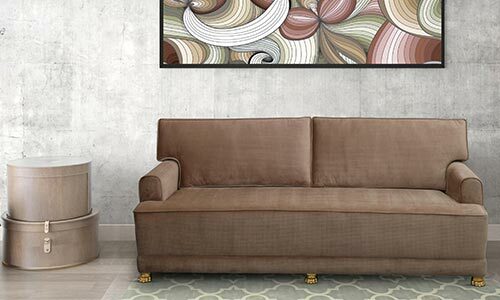 The color and the material of our Leo sofa is the perfect combination that you have been looking for. Experience sheer comfort on the exposed wood frame and an angular backseat. 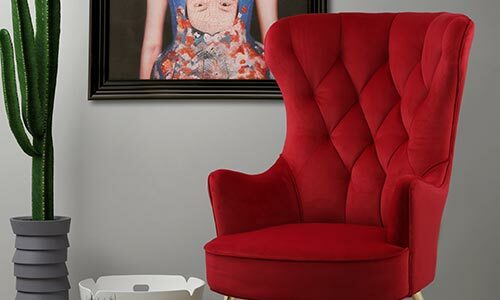 Constructed of steam beechwood, upholstered in a bold red polyester upholstery with elegant brass accent legs, our Mayor Chair has an elegant look. 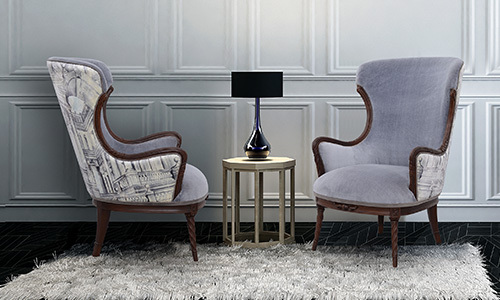 This winged chair with its delicate curved arms set will surely give you all the luxurious feels. Parrot Table is a mid-century Ico Parisi design reinvented in a language of today. 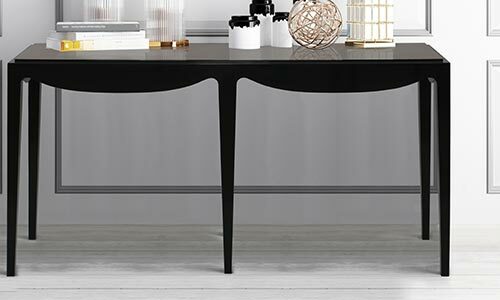 The legs emulate parrot-like forms upholding the table top. Its top is done in Lacquered glass matching the stain of the frame. Parrot makes a high fashion statement in a coffee table. Simplicity and sheer comfort are highlighted in our cane weaved Rey Chair Handmade to precision in Rosewood frame and cane weave backrest, our Rey Chair is a classic. This natural walnut finished chair is a delight to introduce to your interiors.